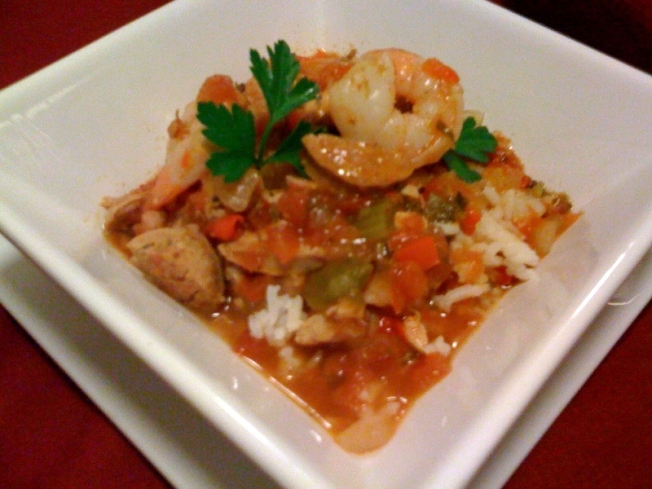 Super Crockpot Jambalaya – A Treat for The Big Game. A hearty make ahead dish that’s perfect for a game day party. I have no allegiance toward the teams competing in the Super Bowl this year. But, the theme for having a party to watch the big game can be influenced by one of the teams. In this case, I took my inspiration from the home of the New Orleans Saints, the big easy. So rather than a pot of chili, I thought it would be great to create big pot of jambalaya instead. Using a crockpot, it can be started early in the day and then just put out on a buffet for your guest to serve themselves. Enjoying this dish doesn’t signal a new allegiance. It just means you liked it! Trim away any excess fat on chicken and then chop into 1” pieces. Season with salt and pepper. Pour olive oil into a saucepan over medium high heat. Add chicken and cook until chicken is just opaque. Transfer chicken to a crockpot using a slotted spoon. Add the remaining jambalaya ingredients from the list above except the shrimp and parsley. Stir, cover and set crockpot to low and cook for 6 hours. Add shrimp to crockpot and continue to cook for an additional 15 minutes until shrimp is cooked through. 30 minutes before serving, place rice, chicken stock, water, salt and butter in a large pot and bring to a boil. Stir, reduce heat to a simmer and cover with a tight lid. Simmer for 15 minutes. Remove from heat but keep lid in place for an additional 5 minutes. Fluff rice with a fork and transfer to a serving dish. Serve jambalaya over rice and top with fresh parsley. This dish is great with jalapeño cornbread and additional hot sauce. If you have any questions, please send me an email at wayne@waynesweekend.com or follow me on facebook. Pour lemon juice, rum, passion fruit syrup, and crushed ice into a cocktail shaker. Shake for a good 1 1/2 – 2 minutes then strain it into a hurricane glass (or tall glass) filled with ice. Garnish with cherry and fruit slices.